For the last 49 years, people around the globe have rallied together in April to celebrate Earth Day, a day of action to change human behavior and provoke policy change. 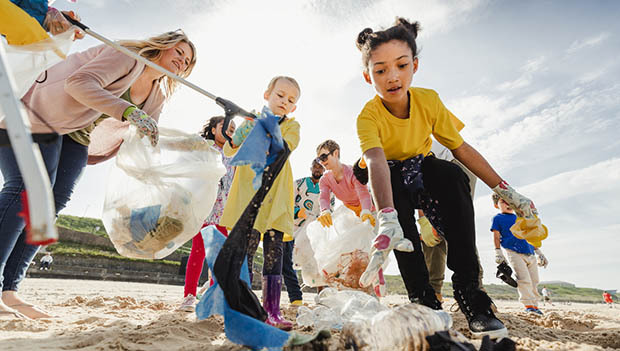 On a smaller scale, Earth Day is a great time to talk to your kids about the environmental issues plaguing the globe, and how small changes can have a big impact over time. To help your family celebrate Earth Day this year, we've rounded up some easy ways to show your kids what the holiday is all about. Most of us understand how important pollinators such as bees, butterflies, birds and moths are to the ecosystem. Without pollinators, our food wouldn't grow. Help give the critters that do such important work a hand by planting a pollinator garden in your yard. Pollinator gardens are filled with plants that provide nectar or pollen for pollinating insects. Your local nursery can help you decide which plants will be most beneficial. Help teach your children the value of pitching in by signing up for a trash pickup event on Earth Day. Even if there isn't a formally organized event in your area, your family can head out with trash bags and clean up the neighborhood. The experience will likely be an eye-opener for your children, teaching them not only the importance of putting litter in its appropriate place but of reducing and reusing so that so much waste isn't created in the first place. In honor of Earth Day, hold a family meeting and collectively make commitment to do something good for the environment. It could be as easy as committing to bring your own bags to the grocery store, turning off lights when you leave a room or making and using natural cleaners to use at home. Post your Earth Day commitment in a place in your home where everyone can see and remember it. To celebrate Earth Day, head to the farmer's market, buy locally sourced ingredients and cook a meal together as a family. Buying food grown locally supports farmers and helps reduce CO2 emissions because the food hasn't had to travel long distances to reach your shopping cart. Locally grown food can be richer in nutrients too because it has been allowed time to ripen instead of being picked prematurely and then artificially ripened using ethylene. Small farms also tend to use less chemicals on their food than industrialized farms. All of this adds up to healthier food for your body and the planet. Planting a tree is an easy way to make the world a better place. Together with your kids, find a place in your yard to dig a hole and then plant the tree together. Fruit trees will bear delicious snacks in a few years while shade trees will grow big and provide a great place to play in the future. Your kids will not only have fun planting, but they'll love watching the tree flourish over the years. There may be simple and cost-effective ways to make your house more environmentally friendly. In celebration of Earth Day, do an environmental audit of your home with your kids to see if you can identify ways that your family can save water and energy. Is there a leaky faucet or toilet that can be fixed? Are you using energy-saving compact fluorescent or LED light bulbs? Can you set your heater's thermostat a bit lower or install weather stripping to make doors and windows less drafty? Not only is this exercise a fun way to spend a day at home, but it will help the environment and save you money too. There is perhaps no better way to celebrate Earth Day than by spending the day outside. Go for a hike, have a picnic at the park, canoe on your favorite lake or take a walk through the arboretum. No matter where you go to get outside, you and your family will be reminded of all the reasons why protecting the earth is so important.